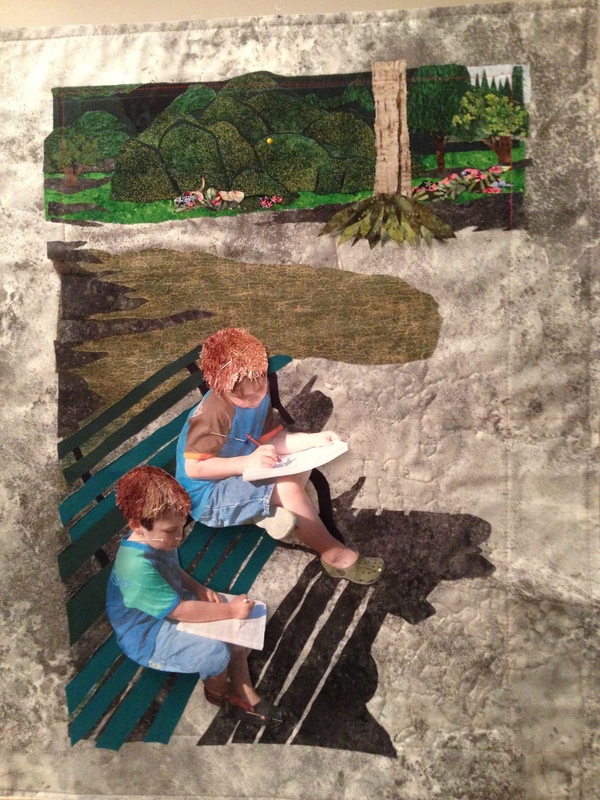 After finishing Asparagus Field in late September, I started a second art quilt: I had photos of my two oldest great-nephews taken a number of years ago when they were 4 1/2 and 6 on a visit to the Public Gardens (in Halifax) – I decided to combine two photos into a single image so both boys would be in the work. I enlarged the photos using Photoshop and printed out sections from which to assemble the piece which I wanted to be ~15″ X 23″. I began by setting up the “quilt sandwich” – a grey stonehenge fabric for the gravel path (which I used to cover the entire piece), batting and heavy fusible stabilizer on the bottom. 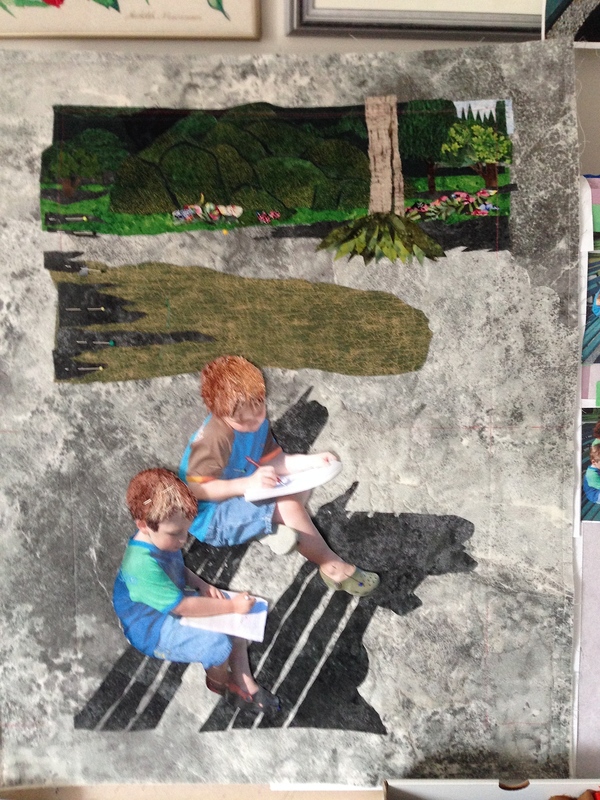 I marked out the finished dimensions, stitched the sandwich together and didn’t get much further than that – the stumbling block was the boys’ hair – it’s the highlight of the piece and I had NO idea how I was going to create it. I played unsuccessfully with yarns of various kinds. In the end I decided to try machine embroidery thread laid on a sticky stabilizer, then stitched into place. It kind of works – I’ve done half-a dozen trials but I’m not quite satisfied — that stopped me doing anything else. At the beginning of the week, with my shirts all done and no new quilt started, I thought – it’s time to get back to this art piece. So I dug out the box of fabrics and got to work. I added a strip of dark fabric to the top edge, below that I used a bright green for grass, then started creating “shapes” for the rhododendron bushes and threes and the large tree closer to the boys. The image gets built up from top to bottom, from background to foreground. I added in bits of coloured fabric for the flower beds. Next some shadows for the bench, the trees outside of the scene on the left side, under the big tree at the top. 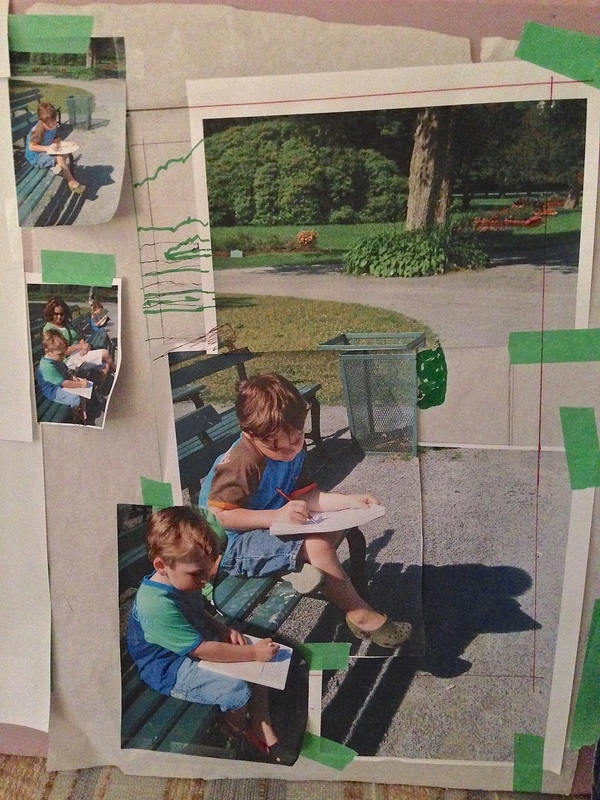 At this stage, the boys are still the paper cutouts with the “hair” pinned on. Not happy with that hair! 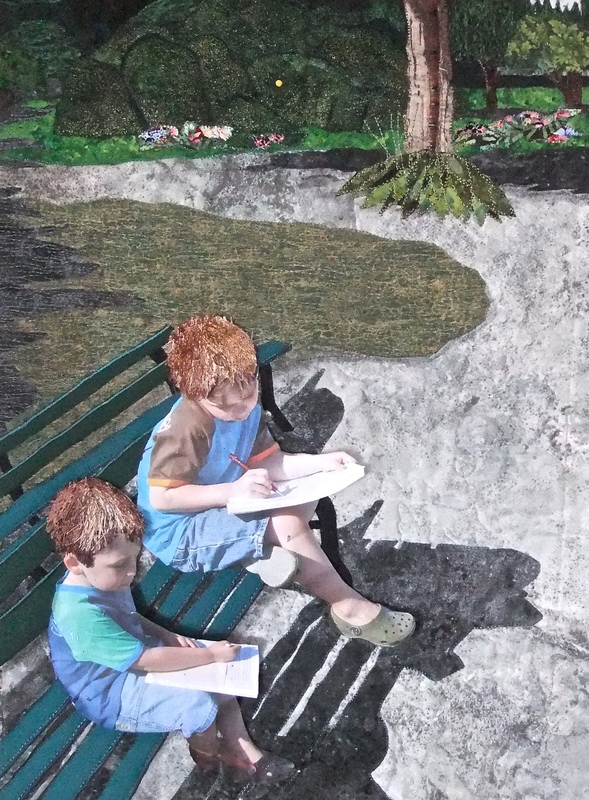 Next the grass gets extended and stitched, the gravel gets filled in with free-motion stitching, then comes the benches – just fused in place at this point (the boys are still those paper cutouts pinned in place). The elements of the background are all in place: the shadows, the benches, the grass patch behind and above the benches, the tree with a hosta patch around it, one of the large rhododendrons in the Gardens, two small flower beds, and some trees in the background. I have stitched them all in place – I need to do much more thread painting: the hosta could use some more leaves and flower stalks, and the rhododendron still needs a lot more stitching using a lighter green thread (I’ll probably use a variegated to give some variation to the texture of the shrub). So far, the boys are still in paper (with the latest attempts for hair pinned on). I’ve carefully traced all the elements needed to construct the boys, figured out an order in which to assemble them, I’ve prepared fabric swatches with double sided fusible interfacing – so tomorrow I’ll start constructing the boys – the bodies and clothing are straightforward – it’s the faces and hair that are still challenging me! I thought I might try setting up a portrait embroidery but my software isn’t sophisticated enough to produce a decent rendering of the faces – so I’ll use a combination of oil pastels and permanent marker to hint at the facial features. The hair – still not sure how I’m going to accomplish that but something will work out, I’m sure. So all that’s left is to create the boys, and do more thread painting before I add the boys to the background. Oh yes, and last – add my signature with a date! 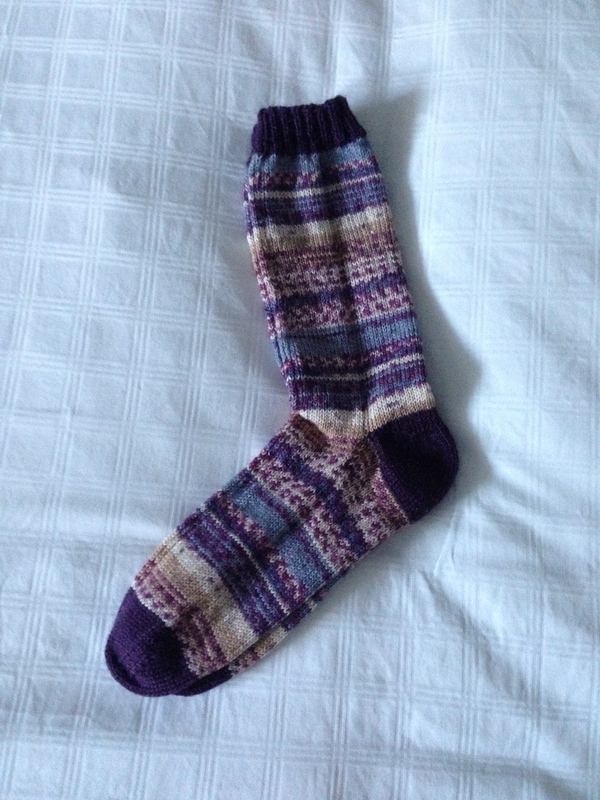 Finished this pair of socks last weekend – in September on my way to Lunenburg I stopped in Mahone Bay at the wool shop (Have A Yarn) and picked up some yarn for my neighbour Joan and two 50g balls of this purple yarn for myself. This pair is in the “gift” stash – waiting for an occasion to pass on to someone. 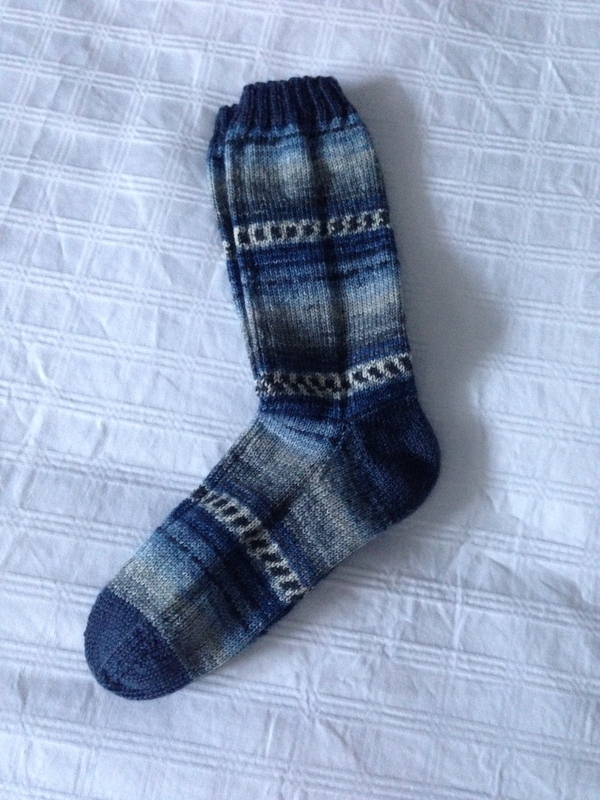 I gave my friend Linda the blue pair I finished a couple of weeks ago. I bought this cherry red wool fabric a couple of years ago at the rug hooking shop in Petite Riviere (River House). Hard finding real wool fabric anywhere nearby – just loved the colour so I bought 2 yards and put it away. 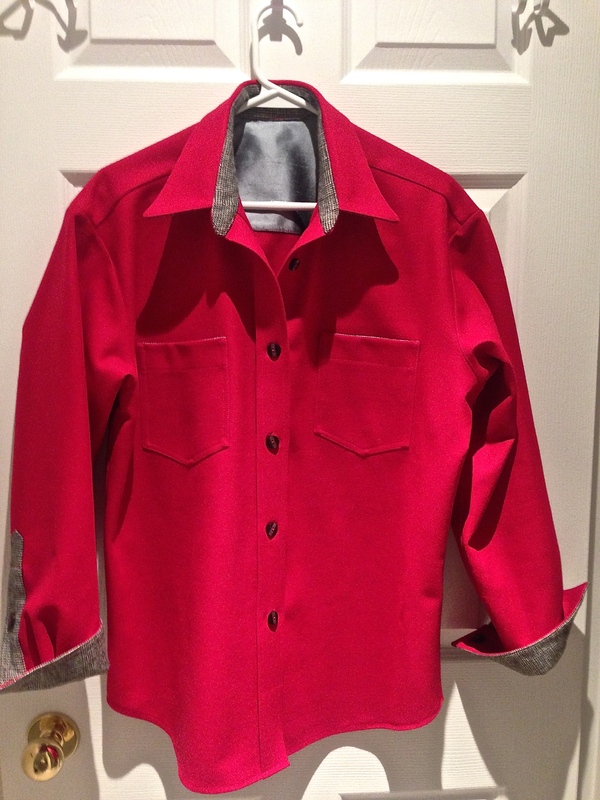 I’ve been meaning to make a jacket of some sort with it – I decided on a shirt last week. I used the leftovers from the last grey stripe shirt (the one with the red and silver threads) for the accent on the under collar, inside of the collar stand, inside cuffs and sleeve plackets. For the inner yoke I used some steel grey silk dupioni I had on hand. The buttons came from a stash of shirt buttons I bought from Pam Erny a while back – there were twelve of these buttons – enough for the shirt. I finally succeeded in doing the “burrito” collar stand application – it isn’t quite perfect because the wool was a bit heavy to work with but next time on a cotton – it’ll be just right! 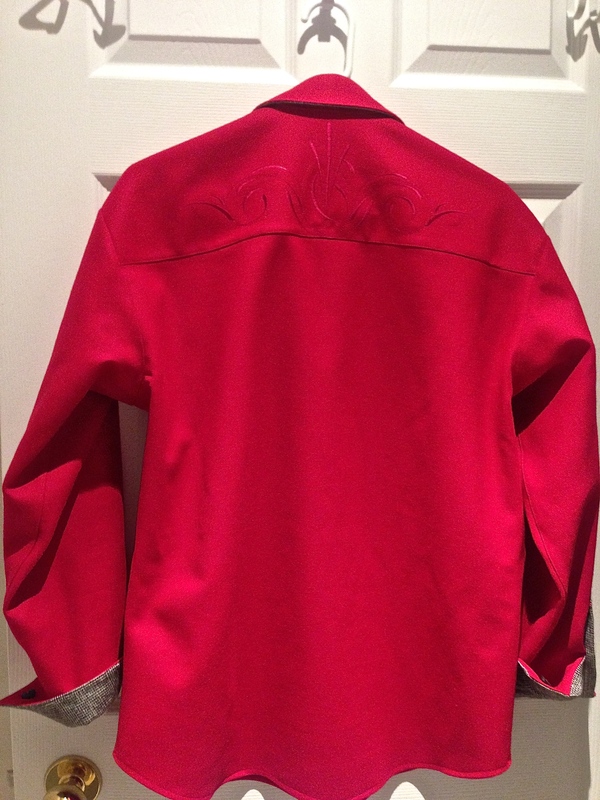 I embroidered the yoke in the back – a cherry coloured thread slightly darker than the fabric. I was pleased with the fact that I managed to get the embroidery absolutely in the centre back. The embroidery was a modification of one of the Pfaff collection: Sensational Swirls. The joke here is that next weekend I’m attending a Scouts Canada event in Toronto and we’ve been asked to wear the “uniform” for one of the meals – I am now officially a scouter (having done Woodbadge I and had the police check, etc.) – so I guess I am expected to wear a red shirt – except I don’t have an official Scouts Canada Scouter Shirt! I will take this one, instead. Finished these the other day. I have to say I love working with that Opal – Sweet ‘n Spicy yarn – the resulting pattern is such a nice one. This pair is ladies size 7 12/ – 8. 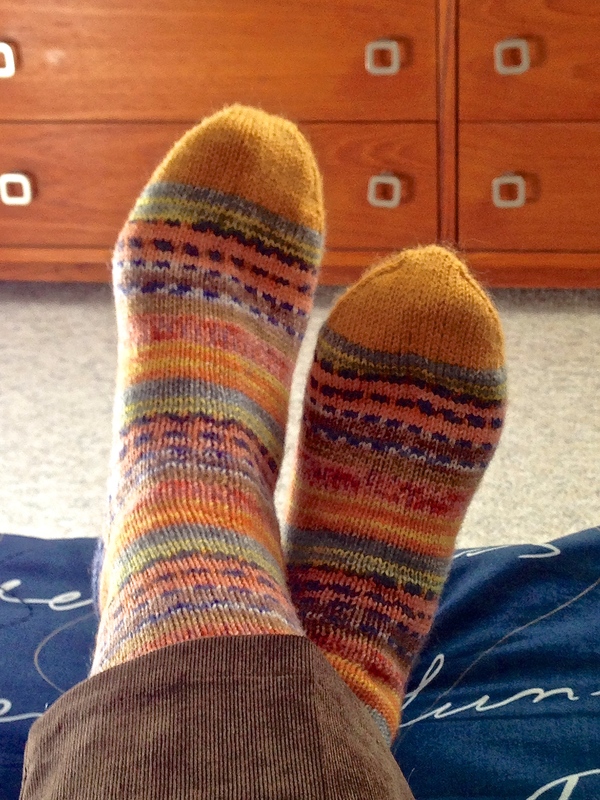 They are in my “to give away” pile – I have lots of blue socks – not tempted to keep these. I do have to admit, however, this yellow pair made it from the give-away pile to my sock drawer last week, when I decided they matched the outfit I decided to wear that day! 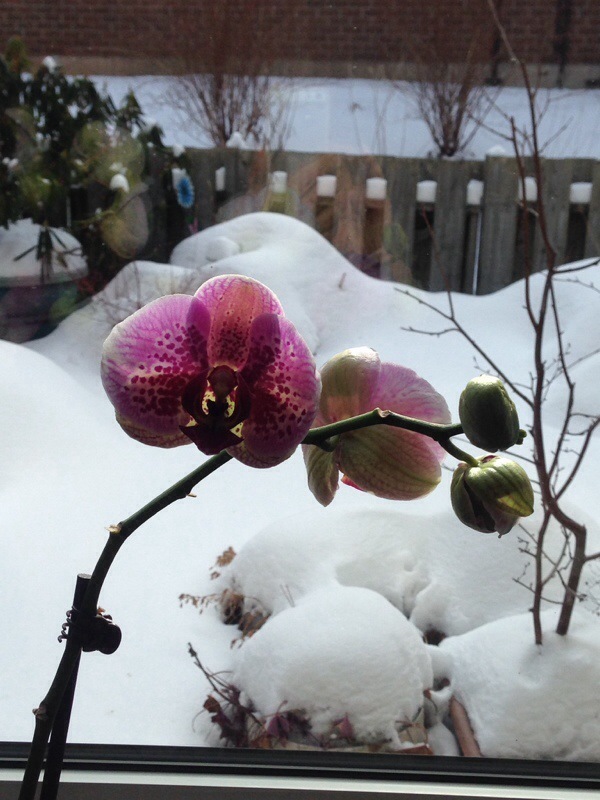 Notice the juxtaposition of the orchid in my livingroom and the snow outside! That’s winter in Canada for you. I have four Phaels in bloom and I was taking pictures this morning when I discovered this one – with the snow in the backrgound. Mid-February – it won’t be long before the snow begins to disappear and then soon there will be flowers in my outdoor deck garden again. 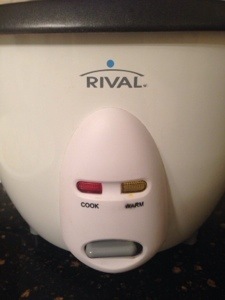 I’m sitting at the island table of a friend – when I noticed the rice cooker on the counter across from me! Very definitely another “face”. I have a travel pillow for my head – one I fill with water so to take it anywhere with me means emptying it out, and filling it when I get to my destination. But I also sometimes need a pillow under my knees when my back is being cranky. 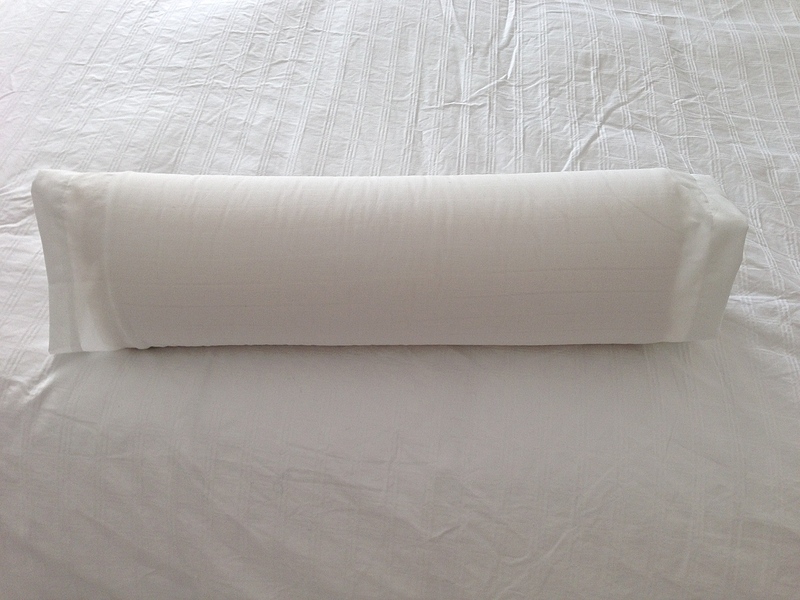 I realized this morning that if I made a tube (I measured the diameter of a rolled up pillow I use now: 22″) of sheeting the length of the pillow and a 22″ diameter, I could roll up and stuff any pillow in it. So I don’t have to take a special pillow when I travel – just take the tube! Takes up no space in my bag.